Dehumidifiers have long been relied on to keep moisture levels constant in a residential, commercial or industrial space, and they perform this role well. But why is it important to maintain moisture levels, and which dehumidifier is right for a given area? The vast number of applications that dehumidifiers offer is impressive, and extends beyond concerns regarding comfort, though they are ideal at producing a comfortable space. They are also relied on to help repair water damage and protect valuable machinery. In general, dehumidifiers come in two forms – residential and commercial/industrial. 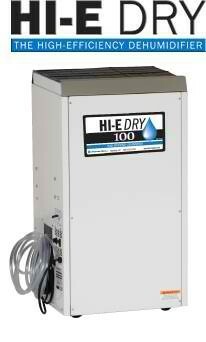 Residential dehumidifiers are smaller and less expensive, while commercial dehumidifiers are larger and more durable. But at their core, both residential and commercial dehumidifiers operate using the same kind of technology. The real difference is between condensation and desiccant dehumidifiers. Condensation dehumidifiers – Condensation dehumidifiers have been around longer and are still represented to a greater degree. They operate by pulling in warmer, humid air and running the air over a set of cooling coils. When the air comes in contact with these coils, its temperature drops, as well as its ability to hold onto moisture (warmer air is capable of higher levels of humidity). Water vapor condenses onto the coils as a result and is collected for removal. The dry air is pumped back into the room, and the process starts again. Condensation dehumidifiers are more efficient at higher temperatures and they maintain humidity levels well. Desiccant dehumidifiers – Desiccant dehumidifiers do not operate using a temperature gradient. Instead, they are designed with a rotary disk that is impregnated with highly absorptive materials like silica gel. Silica gel, like any other desiccant, is filled with millions of microscopic cavities that attract moisture using a vapor pressure gradient. In other words, water vapor is effectively “pushed” into the desiccant. Desiccant dehumidifiers will not freeze and are more economical when operating at lower dew points. Improving comfort – Perhaps the most popular reason for installing dehumidifiers is to make a space feel more comfortable. Higher levels of relative humidity make air feel heavier, which can make breathing and temperature regulating more difficult. Dehumidifiers are, of course, ideal for controlling relative humidity, which dries the air and makes a room, or even an entire house or commercial property, feel more comfortable. Protecting sensitive equipment – In industrial settings, like manufacturing or packaging facilities, there is a great deal of equipment that must be protected from all sorts of environmental stressors. Chief among these stressors is moisture, as industrial equipment is designed with sensitive electronics. When moisture infiltrates industrial equipment, it can clog the equipment up and make it stick, a problem known as moisture regaining. Moisture can also condense on the electronics themselves, increasing the chances of a short occurring. Finally, moisture speeds up corrosion processes and can degrade materials that are sensitive to water. Industrial dehumidifiers, which are capable of removing hundreds of pints of water from the air every day, are designed to maintain humidity levels in a large facility. The presence of a dehumidifier will ensure extended performance of equipment and less downtime. Repairing water damage – Commercially, dehumidifiers play a role in water damage restoration processes. Restoration firms are often tasked with drying out a waterlogged home or business that has been wracked by floods, sewage backflows or burst plumbing. In these settings, time is of the essence, as mold can begin growing in water damaged properties within 48 hours, and once it takes root, it can be extremely difficult to remove. Commercial dehumidifiers, in tandem with air movers and heat injectors, are relied on to quickly pick up a lot of ambient water vapor and vent it to the outside. Several are typically needed for badly damaged buildings, but they can typically get the job done within a few days. Dehumidifiers are a key element of any building maintenance plan, and can be scaled up or down for a property of any size or purpose. Modern dehumidifiers run quietly, are efficient and rarely require maintenance, making them a dependable workhorse for any application. What is a HEPA System? HEPA stands for high efficiency particulate air, and is used to refer to the air filtration or a HEPA system. When a filter is said to be a HEPA filter, it means it is a high efficiency particulate air filter. HEPA filters are the gold standard of air filtration, and are mandatory in demanding applications. However, though they have obvious applications in medical and technology industries, where a single speck of dust or virus can be a serious threat, they are useful in the home and other businesses as well, where they are typically found in vacuum cleaners. In commercial and industrial settings, though, HEPA systems are almost mandatory. A HEPA system is a powered air filtration and purifying system that cycles the room’s air rapidly. This is essential for demanding environments. How Does a HEPA System Work? At a glance, a HEPA filter may look like any other filter, but there’s a lot going on in there. Simple filters like sieves operate on a simple principle. They are built with pores small enough to trap some particles, but anything smaller than the pore is likely to get through. The obvious question, then, is why not just make the pores so small that almost nothing gets through? Unfortunately, this isn’t feasible. The smaller the pores, the more difficult it is to engineer the filter, and the smaller the pores, the more air resistance the filter poses. That’s why it’s impossible to find a sieve filter that is worthy of a demanding application. HEPA filters are built with a few filtering mechanisms. Though they look like corrugated cardboard, HEPA filters are made with a tangle of microscopic fiberglass fibers. These fibers are arranged randomly and layered over each other, so it’s common to find a HEPA system with multiple filtering layers. Impact – Like in a sieve filter, if a particle contacts one of the filter’s fibers directly, the particle is trapped. This is particularly effective for trapping larger particles, as they are more readily pushed around by air currents. As they follow the air currents that wind around individual fibers, they inevitably come into contact with one. Impact filtering works better when air flow is high and when fibers are tightly entangled. Interception – When a particle comes into contact with a part of a fiber, and is then grabbed and pulled into the filter, this is interception. It works well for particles of all sizes and at a wide range of air flows. Diffusion – Diffusion isn’t a filtering mechanism by itself, but improves the chances of impact or interception occurring. Particles that are extremely small in size, as in less than .1 micrometer in diameter, can be pushed around by gas molecules. As these particles contact gas molecules inside the filter, they are bumped into the filter as a result. Diffusion works best when air flow speed is low, and when air flow is particularly low. Diffusion is, by far, the dominant filtering mechanism present. Together, these filtering principles allow HEPA filters to capture at least 99.97 percent of all particles that are .3 micrometers in diameter. An interesting note – HEPA filters are better at trapping particles both larger and smaller than those .3 micrometers in diameter, but particles this size are the toughest to trap using the above methods. The 99.97 percent mark is what most U.S. industries and the Department of Energy consider to be the minimum to be branded a HEPA filter. However, there are HEPA filters capable of much more, including filters that can remove greater than 99.9999 percent of all particles at .3 micrometers in size. This type of filter is usually reserved for military or medical use, as they can reliably filter out major hazards like viruses and radioactive particles. HEPA systems intended for biomedical use are usually built with ultraviolet light emitters, as these destroy almost all bacteria and viruses that are trapped by the filter. Combined with the HEPA filter’s excellent capture capability, this offers an excellent layer of defense against airborne diseases. HEPA filters are also a must when performing extensive cleanup or restoration duties. They are relied on to trap hazardous airborne particles that can accrue in a building. For example, water damage restoration often necessitates mold removal, and mold releases microscopic spores into the air when agitated. Vacuums and air scrubbers with HEPA filters remove mold spores before they have a chance to form new colonies. Asbestos particles can be removed in this way, as well, though HEPA filters should only be considered a component of asbestos removal, and not the only mechanism in place. What Makes Pro Drying’s HEPA Systems the Best on the Market? Pro Drying offers an array of HEPA systems manufactured by Phoenix, and they are designed for nearly any task. Phoenix’s Guardian HEPA system, for example, is designed to scrub a lot of air in a hurry, with two-speed operation (1,400 and 900 CFM), several ducting options for optimal placement versatility, and an optional fourth stage carbon-potassium filter. The Guardian is a beast of a HEPA filtering system, but it is built with stainless steel and in a cart design, so it can be maneuvered with relative ease. On the other end of the spectrum, Phoenix’s Guardian R500 system offers an unbeatable combination of filtering efficacy and portability. It is capable of 500 CFM of airflow, maintaining HEPA standards, while only coming in at 35 pounds. It is also extremely compact, with a 22 x 24 x 14 inch footprint. In a room containing 7,500 cubic feet of volume, the Guardian R500 will exchange the room’s air four times every hour. It’s a thorough piece of HEPA filtering technology that can be moved around with ease, making it an ideal choice for restoration applications. HEPA filters should be considered a must when protection from diminutive particles is the priority. HEPA filters are proven technology and are cost-effective means of keeping the air clean, and there is an ideal model for any type of environment. 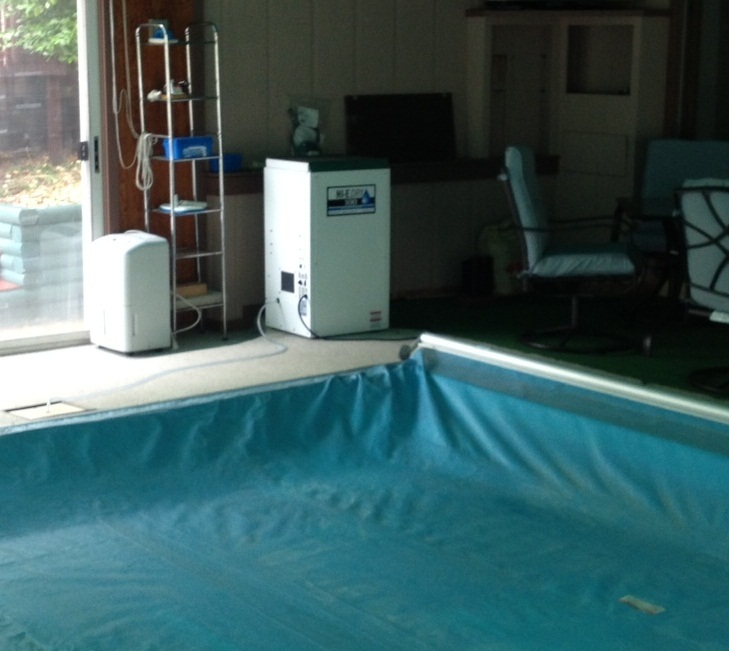 Pool and Spa Dehumidifiers will help you control the indoor environment and humidity within your space. These units will create comfort for anybody using the room.